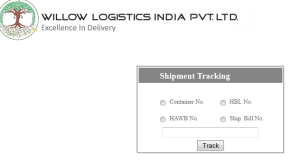 Willow Logistics India Pvt. Ltd is a young, dynamic company which offers the logistics solutions which include international services all over the world. It constantly trains its employees to deliver the efficient logistics services to its customers nationally and internationally. It offers wide range of logistics services to its customers satisfying diverse needs of customers. Ocean and Air Freight Forwarding Services, Logistics and Distribution Services, Customs Clearance, Pick and Pack, Reverse Logistics etc are different services offered by the company. From collection to delivery, the company take care of shipment and makes sure that both sender and receiver expectation are met by the company. Following are the contact details that include Email Id and Head Office Address which can be used to get the queries solved. To track the consignment, customers can refer the Online Tracking Form . The form appears as shown below for customer reference. Customers need to select the type of number using radio button. Enter the Tracking Number in the field given in the form. To continue the tracking process, click on Track button. For more details about the company and its services, customers can refer the company Website: www.willowlogistics.com .